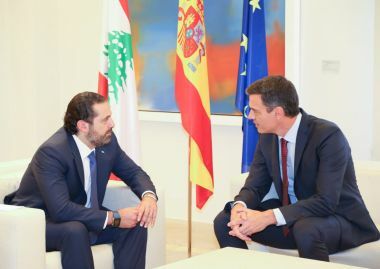 Lebanon - Prime Minister-designate Saad Hariri held today talks with his Spanish counterpart Pedro S?nchez Pérez-Castej?n on the developments in Lebanon and the region and the bilateral relations between the two countries. Hariri was received at Moncloa Palace by his Spanish counterpart. After a bilateral meeting between Hariri and S?nchez, an expanded meeting was held. Caretaker Minister of Culture Ghatas Khoury, the Spanish Minister of Culture José Guirao, Lebanon's Ambassador to Spain Hala Keyrouz, Spain's Ambassador to Lebanon José Mar?a Ferré de la Pe?a and members of the two delegations attended. Hariri wrote in the book of honor the following statement: "I look forward to developing our bilateral relations with this beautiful country which has always helped Lebanon. We must work together for the benefit of our two peoples. The Lebanese people and I also thank Spain for its soldiers who are part of UNIFIL and who contribute to securing peace in Lebanon".